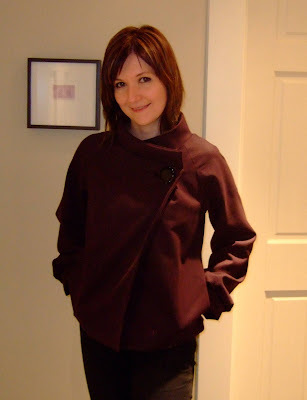 My purple wool jacket (Vogue 8436) is finished and not a moment too soon - temps here are down in the 50s and 60s now (~12-15 C). I made the shorter View A length with the collar from View B. The pattern couldn't have been easier to make up. I love not having to set in sleeves! 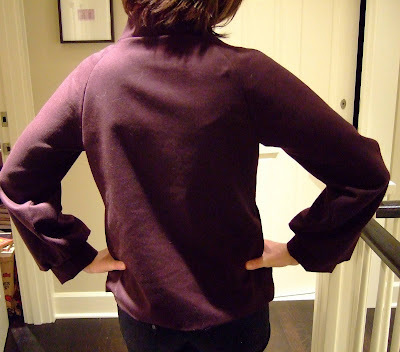 Sleeves: as you know, I was unhappy with the puffy sleeves, so I redrafted them to be basically straight. Still gathered them a bit at the cuffs. 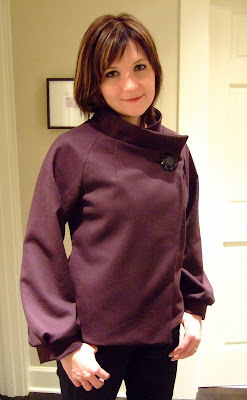 Pockets: I added in-seam pockets (because I always like to have someplace to put my hands!). 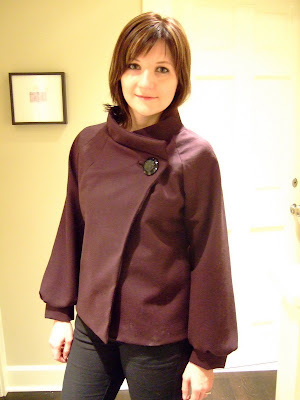 If your pattern doesn't include pockets, Burdastyle now has a great tutorial on how to do this (part 1, part 2). 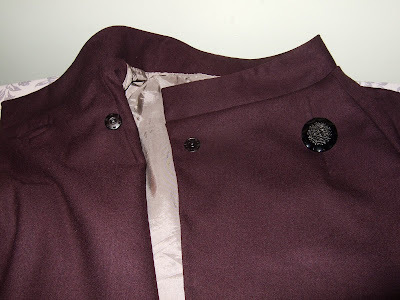 Closures: This instructions tell you to apply several "coat snaps" to keep the coat closed, but I used only one on the side opposite the button. I finished the buttonhole as a bound buttonhole. I made it a little bit "fat" for a bolder look. I used a vintage button as the main closure - it's 1.75" (4.5 cm) wide. It's the same one that you see in my blog header. I got this button about 4 years ago when I purchased an accordian-style sewing organizer at an estate sale. 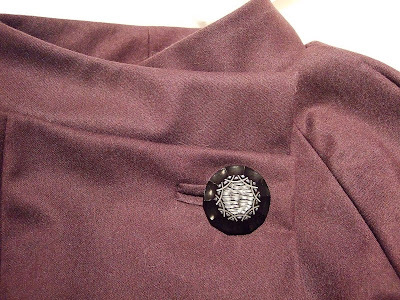 This is the perfect garment to highlight this button, and it makes me happy every time I look at it! I'm pretty happy with how this turned out. I love the simple design. Very cute and elegant, and like you said, not a moment too soon. Christina, it's AWESOME!!! I like the sleeves so much better now and that vintage big button gives it that special touch! Great job! Christina, it is beautiful and it looks really great on you! I love it, it looks awfully chic and sophisticated. You are so stylin' in this. Wow. I love it! You did a great job. It looks fantastic on you. Wonderful work! Love the angles. This looks great on you. Very stylish! the collar looks great, and i really like the look of the asymmetrical closure! Beautiful jacket! I love the purple! Looks wonderful! And couldn't agree more about needing something spiffy for the foul weather here. Love your jacket, especially that color and the vintage button. I am eyeing that same patter as well and am thinking about making it with some houndstooth wool fabric (the collarless version). After reading about your experience, I am inspired to put two inseam pockets too. Great job! That's fabulous, I'm so impressed with what people can create. Love that color on you as well you look very glamorous. That looks beautiful!! I'm glad you opted for the shorter version, and the sleeves look great! So cute! That pattern is now on my list. Cute! I love the changes you made. Now, I need that pattern. Color - great! Style - simple with interesting details! Finished look - so very wearable! Great job, Christina. I really like asymmetrical closures for interest. It's beautiful, stylish, and it really suits you. You have a small, delicate, doll's face. My daughter is like that. sometimes I call her "little face." I think the button is what makes the jacket special! Great job on a very chic and kewl jacket.